Recently my dad has been in and out of the emergency room as he is getting blood clots, has difficulty breathing, and is fighting cancer. He’s at home now, although weak. When I was sitting in the hospital room, watching him sleep, I had plenty of time to think back over all the years I’ve known him, special memories of growing up. One of those memories was my dad getting out his 1950’s records, blasting the tunes while my sisters and I danced all silly and slid across the floor in our woolen slippers. It still makes me smile. 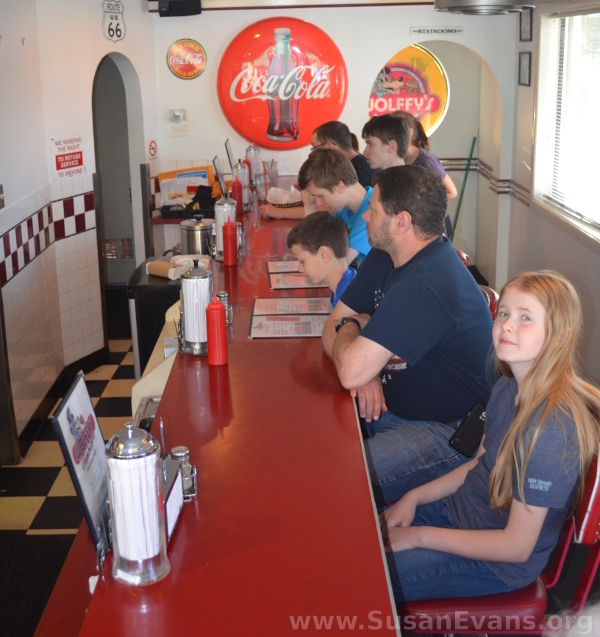 So when I came across these pictures of my husband and I with our children in a 1950’s malt shop in Spokane, I stopped and thought about why the 1950’s meant so much to me, even though it was long before I was born. It meant a lot to me because it meant a lot to my dad. 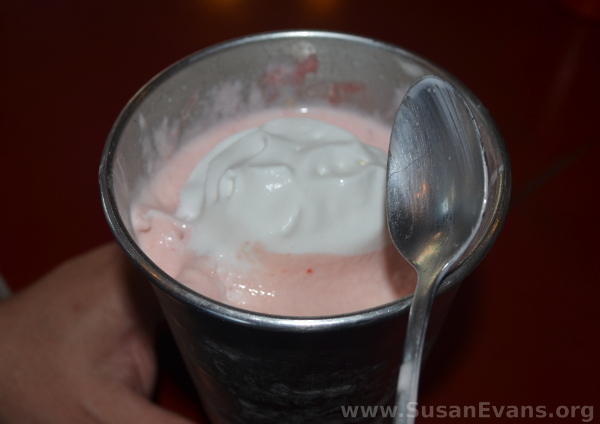 I remember back when I lived in California, I took my dad to a fun 1950’s malt shop where we were able to experience the ambiance of my dad’s favorite decade, from 1950’s music to the decor to the flavors of the food. His face lit up with joy because he was transported back in time. 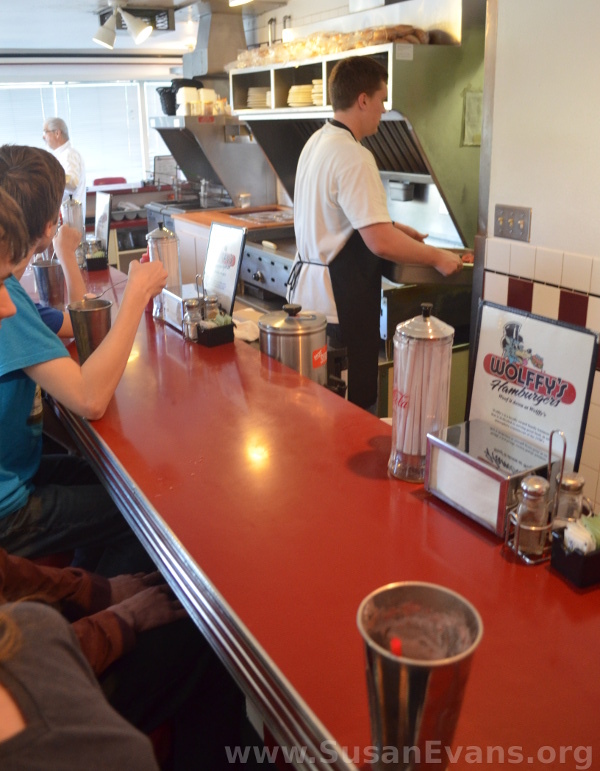 My dad looked so happy, sitting in the booth with me, eating his burger and fries with a malt. He was quite emotional. It was like going back to your grandma’s house after many decades, breathing in the familiar environment where so many happy memories were made. The aroma of my own grandma’s house would always transport me back to childhood, and I felt young and free again, with the whole world opening up before me, full of endless possibilities. 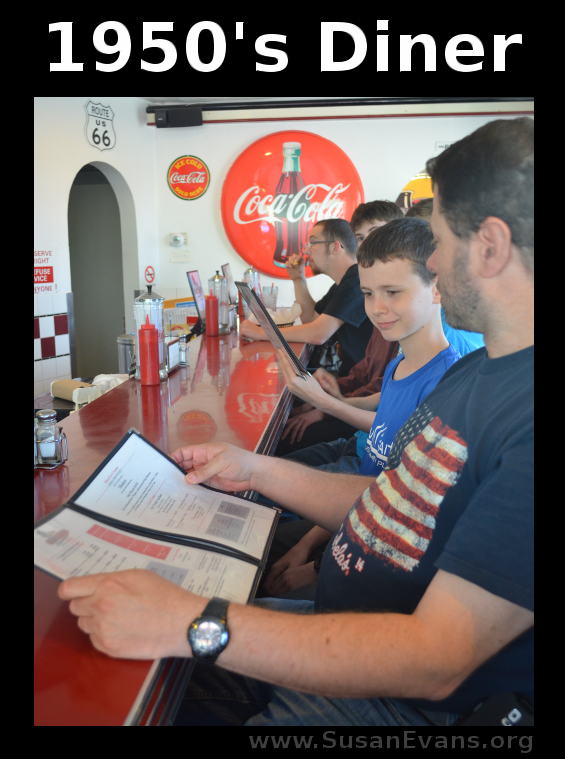 Now I sit looking at these photographs of my own husband and kids, enjoying a modern history field trip where we were able to experience the 1950’s as if we had lived through that time period for real. Some day my own kids will look back on their own memories of their parents blasting through the house our favorite decade music–the 1980’s. My own kids have a love for 1980’s music because it was played the same way my dad played his music, with joy and nostalgia. To see the 1950’s birthday party I threw my dad several years ago (including pictures of my jukebox cake and poodle skirt), click here. 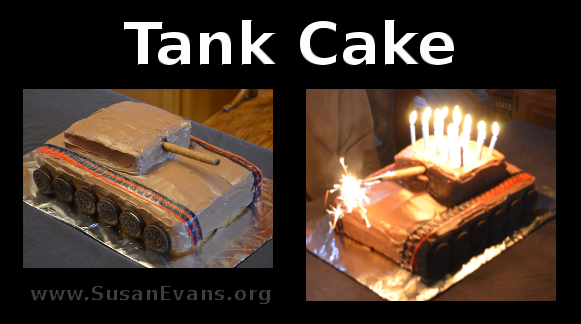 We created a fabulous tank cake to celebrate modern history. We lit it up with a sparkler in the barrel of the tank. It looked cool all lit up! 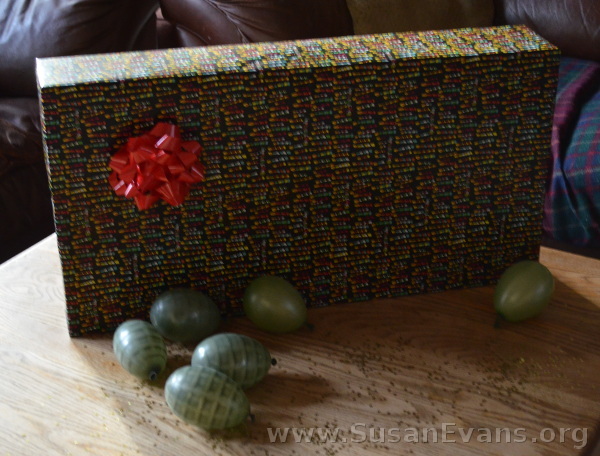 This army party was perfect for my teen son’s birthday. We baked three rectangular cakes because we wanted the wheels to be the height of Oreo cookies. It depends what recipe you use for your cake, but we used two regular cake mixes for the base of the tank, stacking them after they were cooled off. Then we cut a square out of the third cake and placed it on the top of the tank. We frosted the whole thing with chocolate frosting. I’m sure we used at least two tubs of frosting from the grocery store. Don’t scrimp on the frosting. 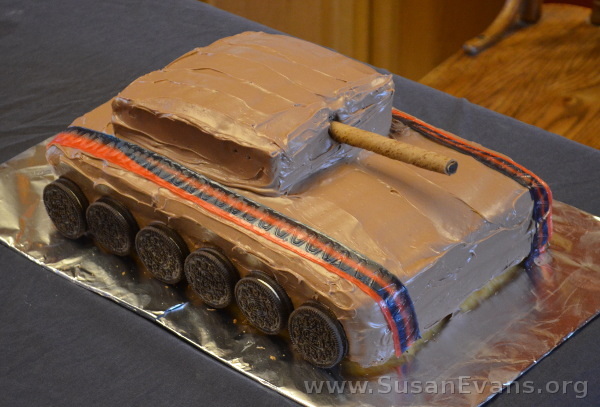 We placed Fruit Roll-ups along the sides of the tank cake, to make the tracks. Then the Oreo cookies were placed on both sides, on the edge. The barrel was a Pirouette. I wanted to be able to stick a sparkler into the barrel, which is why we didn’t use a Twix chocolate bar like we originally brainstormed. If you are not lighting the barrel with a sparkler, you could easily use a Twix chocolate bar. I threw down a black bed sheet onto the table and sprinkled some sand in the middle of the table. 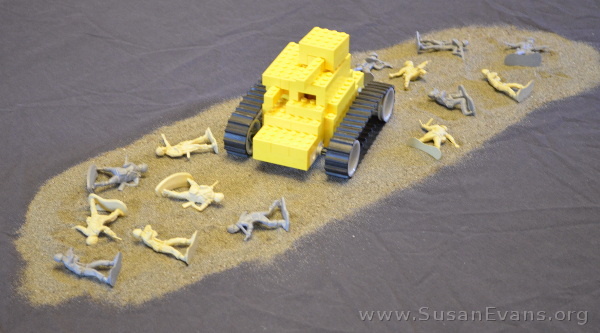 I placed a LEGO tank in the sand, and I sprinkled toy soldiers around like confetti. For more instructions on how to make this centerpiece, watch my tutorial: LEGO Tanks of World War II. We decorated the room with grenade balloons, which I must say were extremely difficult to blow up. That’s because they were water balloons! If you are celebrating this army party in the summer, you could have outdoor activities involving grenade water balloons. You can have your guests dress in camouflage if you want to make the experience even more authentic. 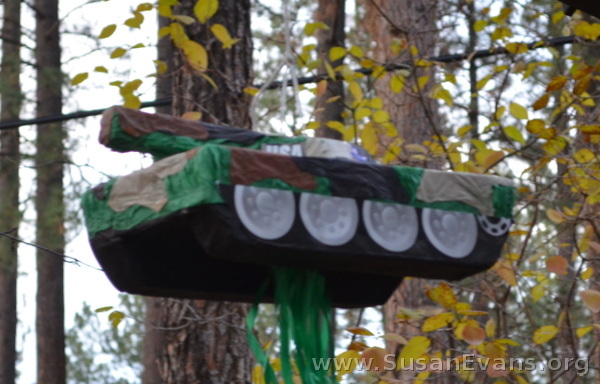 We also found a tank piñata, which was the reason my son chose this theme. (He saw this tank piñata hanging at the party store and wanted it.) Whacking a tank is very satisfying, especially for boys, making this a fun activity to end this army party! 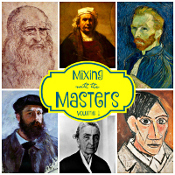 For more hands-on activities for modern history, check out my modern history unit study! 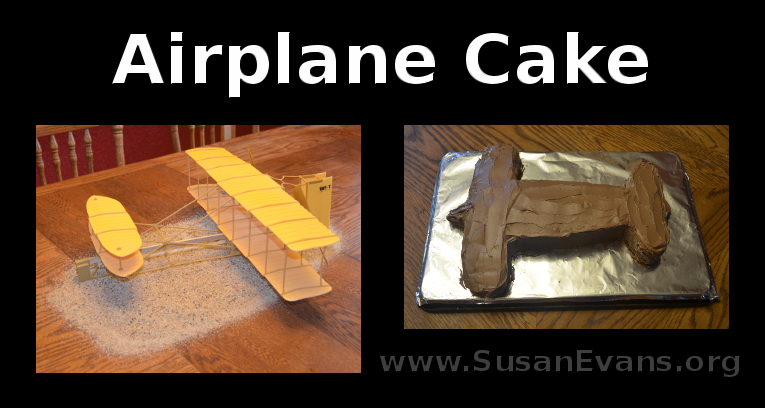 I’m going to show you how to make this cool airplane cake. My son recently had an airplane-themed birthday party, and we placed his model airplane in the middle of the table on top of some sand as the centerpiece for the table. We baked a rectangular cake and up-ended it on a cutting board. I cut out the shape of an airplane. 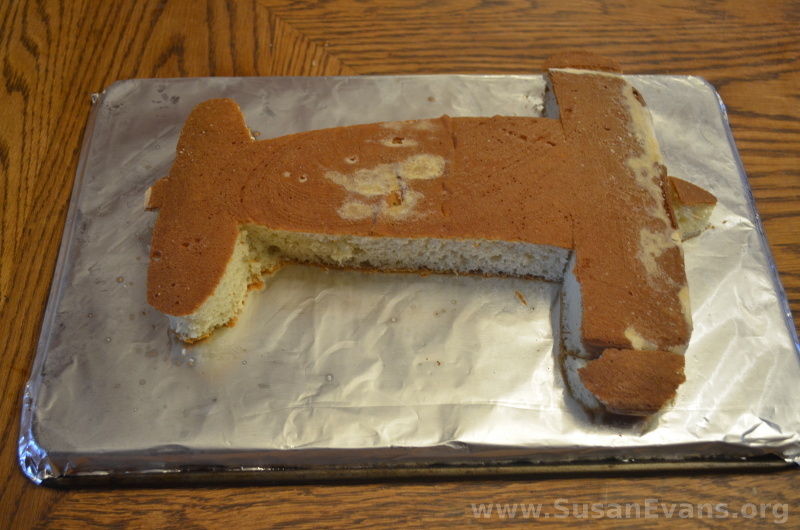 The wings weren’t long enough, so the cake that was cut out of the sides–I used this extra cake to expand the length of the wings. I also placed a triangle on the front of the plane. I placed foil on an upside-down cookie sheet. 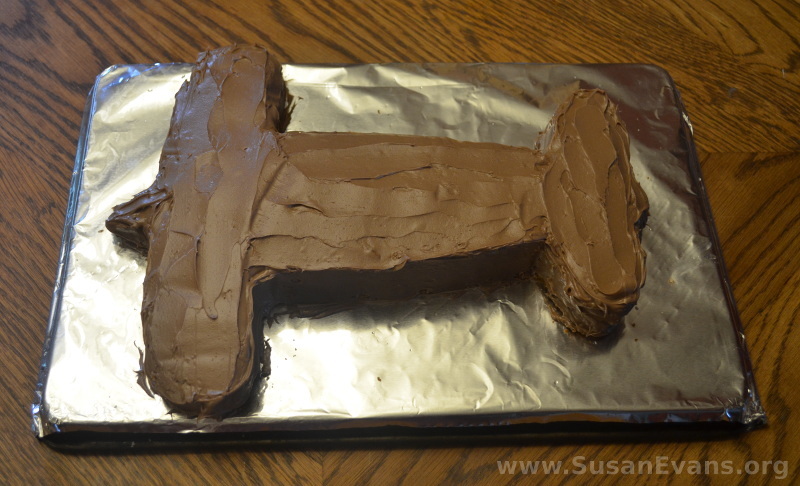 Then I frosted the cake with chocolate frosting. If you want to use candy for a propeller, you can add that detail. We looked for an airplane piñata, but we couldn’t find one. 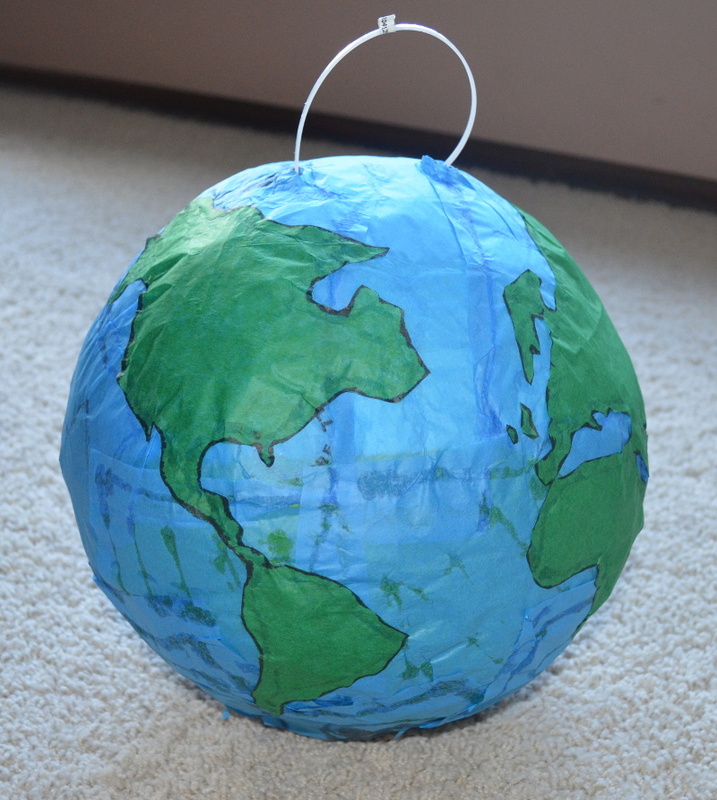 We saw a beach ball piñata, and we covered it with blue and green tissue paper to create a world. The world, after all, is for traveling. Airplanes help people to travel around the world! We covered the entire piñata with blue tissue paper first and let it dry. Then we cut out continents from green tissue paper. I outlined the continents with black Sharpie marker. 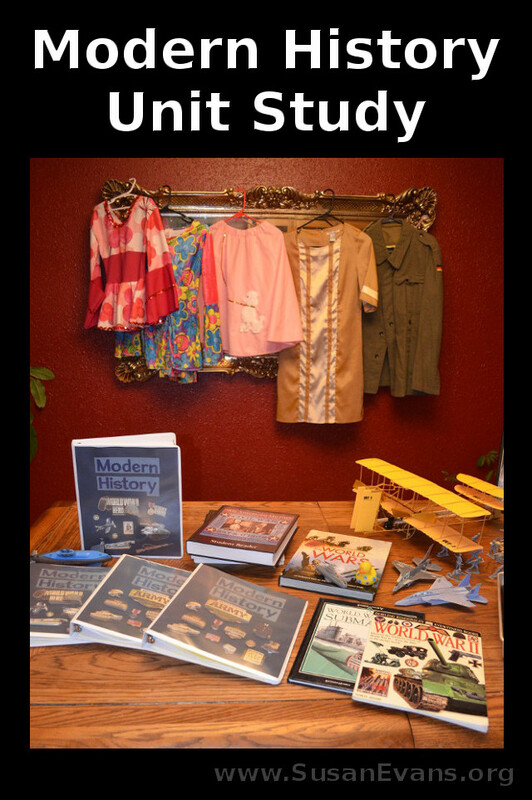 If you want to see our Airplane Unit Study, it is in the large Modern History section of the Unit Study Treasure Vault! Before I began teaching this Modern History Unit Study, I was shocked by how few activities I found that brought to life this time period. With the help of All American History, Volume II and my own flair for unit studies, my kids had a wonderful time doing hands-on modern history! We enjoyed all the printables that we were able to use in our modern history notebook, as well as many of the hands-on suggestions mentioned in the teacher’s manual. The culture of each of the decades came through clearly in the textbook. Even though I don’t normally use textbooks, I was able to break down each event in modern history into unit studies. I hope you enjoyed our modern history unit study as much as we did! 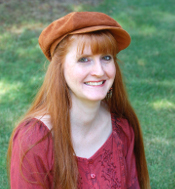 Use any of these ideas to help your kids to bring this time period to life. Make modern history unforgettable!